Hi. I'm Chris Shattuck and in this video we're going to be talking about using Forms in Drupal. We're going to be starting at the very beginning. So in this video, we're looking at Forms built with just with HTML and some simple PHP; the reason for this, is because I want to demonstrate the different components of a Form clearly, so that you know when we're building a Form with the Form API in Drupal, why we're using certain things, and what is sort of happening behind the scenes. This will also give you an appreciation for how much you can get done with Drupal API, with very little Code. So we're starting out very basic; I'm assuming that you know very little about HTML Forms, very little about PHP, and we're going to start very simple and work our way up to a complex Form with full Validations. First of all I want to go through the roadmap of this video and explain what we're going to cover and in what order. First of all we're going to create a simple Form with HTML so you can see how Forms are structured. Then we're going to move on to Formatting the Form so that its consistent and more useable in terms of how a User would use it so we want to make sure it is presented in a way that makes it easy for people to fill out. Next, we're going to look at Validating the Form; our very first step is going to be indentifying how we get the content that gets submitted to the Form out of the Form so that we can use it in various ways. Next, we're going to look at some very basic Validations; so we're going to check to see the content that somebody puts in an input actually exists. So if it's blank, we want to go ahead and throw an error. Next, we're going to improve the usability of the Form by making sure we have some different components to pinpoint where the problems in the Form are so that the User knows what they need to change in order to continue with the process. Now this is a very stripped down example of the Form, and so I want to address very briefly some of the things we're missing from this Validation. The next, after Form is Validated, is Processing; taking the information and doing something with it. In this case, we're going to look at what it takes to put that information into the database that runs Drupal. So we're going to look at the wrong way to do it first, and then we're going to look at the Drupal way; how do we input stuff into the database by in a safe secure way that leverages a Drupal API. Once we have content in our database, we need a way to be able to edit that content, and delete. We're going to do that through the use of Forms. If you ever used an online CNS tool, or an offline database tool like Access or File Maker, then you're familiar with the idea that in order to manipulate data, you need to use Forms to do it. We're going to be pulling out information from our database and displaying it. At this point, we're not going to go through the entire Code to do this, but we're going to look at the implications for providing this functionality; what are the things that we need in place, what are the things we need to check in order to make this possible. The reason why we're not going to the Code in depth is that it would take a long time to build that Code and explain in detail how the actual Code works, because we would need to access a lot of PHP Functions, we would need to abstract out things into our own Functions, and so we're going to keep this real simple. I'd rather use that time to explain further how to use the Drupal API to save time, and to get the kind of security in that functionality that you need. This point in the video, we're going to kind of be stepping out of the real Code examples, and we're going to be looking at, just sort of, conceptually what we need to do in order to achieve these. Next, we're going to look at how to improve Form Security; so out Forms are big geeping holes into our Website, and we need a way to make sure we can monitor what comes in, what comes out of our Site. Finally, we're going to look at how we can expose our Form to other Modules, other Code, so that it can be manipulated by other people. Now again, we're looking at this more conceptually rather than an actual Code because to build us an actual Code would be a tremendous, tremendous amount of work; but I want to explain sort of the implication, of supplying that functionality. Before we start actually building the Form, I would like to spend just a moment to give you a conceptual framework for the importance of Forms in our Website. So if your Website is basically your company home, it's where important information is stored, it's where people discuss things, then the doors to that building are those Forms on your website. At these doors, there's a couple of things that happen; one is you provide information to the individual's coming in to help direct them to the right place, if they're delivering a package, if they're coming to work for the first time, you want to send them to the right location in the building. So Forms in a way provide guidance for people to go to the right place to accomplish whatever task they are there to do. At the same time, you also need some security checks at these points of entry into your building because you don't want people coming in with guns, or whatever, and a Form is very similar in the respect that it has a couple of purposes. One is that we want to help people who have positive intentions do whatever it is they need to get done, so if that's submitting a Form to contact us, if it's submitting a Form to submit information to the Site, or upload something, we want that to be easy for them, and we want that to provide them with the right tools in order to be able to do that. At the same time, we need to make sure that malicious folks usually Bots that are coming through and trying to fill out Forms automatically, or checked and we make sure that there not submitting anything that's going to be harmful to our Site. So let's go ahead and get started with step one: Creating the actual Form. The purpose for this form that we're going to be using in these examples is to allow the User to submit a comment, so similar to what you'd see at the bottom of a blog Post, where there's comments and discussions, this is for a User to submit comments. So we have three inputs, a Name, and E-Mail address and Comments. Let's go through this form line by line and explain the different components. So the first line is where we define the form tags; so you can see the beginning of the Form tag and here's the end. Everything that goes into the form goes between the form tags. We have two attributes in our form tag, you can tell when you are looking in an attribute because you see a Name, and a Value separated with an equals sign; so in this case, our method is Post. Now there are two methods that we could use for this form: Post and Get. Most of the time we're going to use Post, probably ninety-nine point nine, nine percent of the time; the reason for that is because when you use Get, when you submit the form, all of the information that you submit goes into the URL; that can be really handy for very certain cases but most of the time you want to pass that data behind the scenes, you don't want it to be part of the URL for security purposes especially. So, good rule of thumb is just to stick with Post. The Action attribute tells us where this form will be sent when it's submitted. In this case, what we're going to do is submit the form back to the page where the form was created, so it's kind of a cycle. What that will allow us to do is Validate the form and let the User know when there is missing something in the form and be able to manipulate the form directly; that's really nice when it's all on one page. The next three lines are the inputs that we're going to use for gathering data. First are the Names we have just some text with Name, then we have an input with the Type text, so this is a single line, and I'll show you this in just a moment. But then we'll also give it another attribute which is the Name attribute; in this case, we're giving it the Name, Name, because that's the information that we're gathering here is the User's Name. This is the Identifier when we're gathering that information back after the form has been submitted. The next line is E-mail. You can see it's very similar except the Name is different; in this case the Name is E-Mail. Finally, we have the Comment line which has a new type of input, which is a text area, now that's a block, where you can input a bunch of text. In this case, we're setting the Name to Comment and we're adding an ending tag for text area because if we have a default Value for this then it will go in between, and I'll show you what that means later on. Finally, we have an input type equal submit, and that gives us a submit button that we can press to submit the form. Let's go ahead and see what this actually looks like. So, what I'm going to do is copy this content and I'm going to go to my Editor. Here I have a PHP page that I've created. This is the original BuildAModule series on Drupal 6 development along with coverage of some additional tools for developers. Weighing in at nearly 9 hours, with over 30 videos, this is a great way to get started with Drupal 6 development. 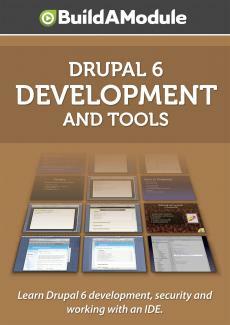 This collection is intended mostly for PHP developers who want to learn how to code for Drupal. Having a solid foundation in working with Drupal on the front end will help you understand why we need to approach certain tasks in the way we do. Also, a basic understanding of PHP will be useful.